In 2013 BIGG received a State NRM Program Community Grant, ‘Barossa Producer Groups Sustainable Pasture Challenge Paddocks’ from the Department of Environment, Water and Natural Resources. The ‘Barossa Pasture Challenge’ aims to design and implement a cost effective, innovative, sustainable and productive pasture renovation program for paddocks in the region. Local producer groups including Angaston Ag. Bureau, Koonunga Ag. Bureau, North Rhine Sheep Group, Mount Pleasant Beef Group and Barossa Mid North Dairy Discussion Group, ‘challenged’ each other to increase productivity and achieve good NRM outcomes for six nominated pasture paddocks in 2014. 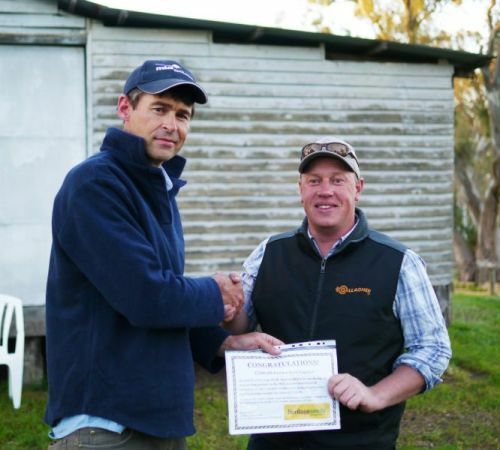 The Challenge concluded in spring 2014 when an independent agronomist judged each paddock. Prizes were awarded for various categories, including; the pasture which demonstrates the most improvement throughout the growing season, the most profitable pasture, and the best all round pasture. The Steinerts won best overall pasture, judged by consultant Tim Prance on pasture profitability, botanical composition, ground cover and production potential. They received a $500 pasture seed voucher donated by Heritage Seeds (see picture presented to Chris Steinert by BIGG Technical Facilitator, Brett Nietschke). Other winners were Andrew Koch, representing the Barossa Mid-North Dairy Discussion Group, who won a $50 Coopers Farms Supplies voucher for the most improved pasture, and Jamie Nietschke, representing Koonunga Ag Bureau who won a bag of ryegrass seed donated by Farmer Johns for the most profitable pasture. View the media release (BIGG win for premium pastures) for full details of the awards, while the background information and production of each pasture can be found in the Challenge Walk Booklet. The prizes for the Challenge were proudly sponsored by Heritage Seeds, Coopers of Mt Pleasant and Farmer Johns.